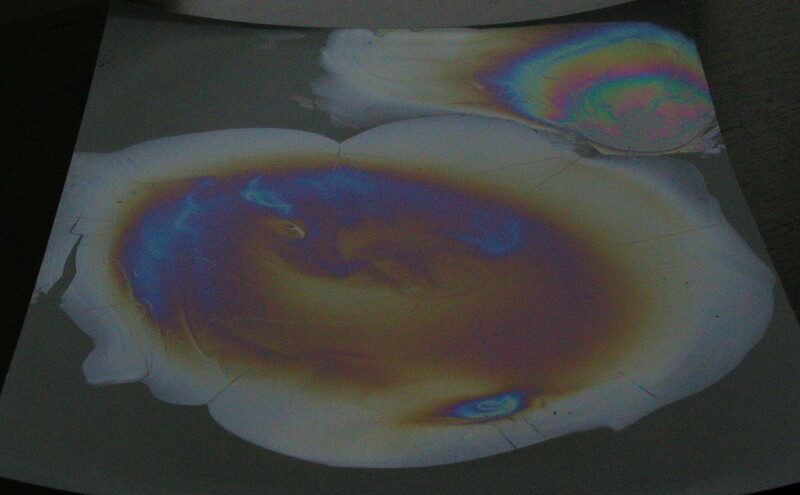 You have probably seen the beautiful rainbow colors caused by a tiny bit of oil floating in a puddle of water. In this project, we are going to capture those colorful patterns on paper, in a permanent form, so you can view them anytime you like, without a messy puddle. A piece of paper. 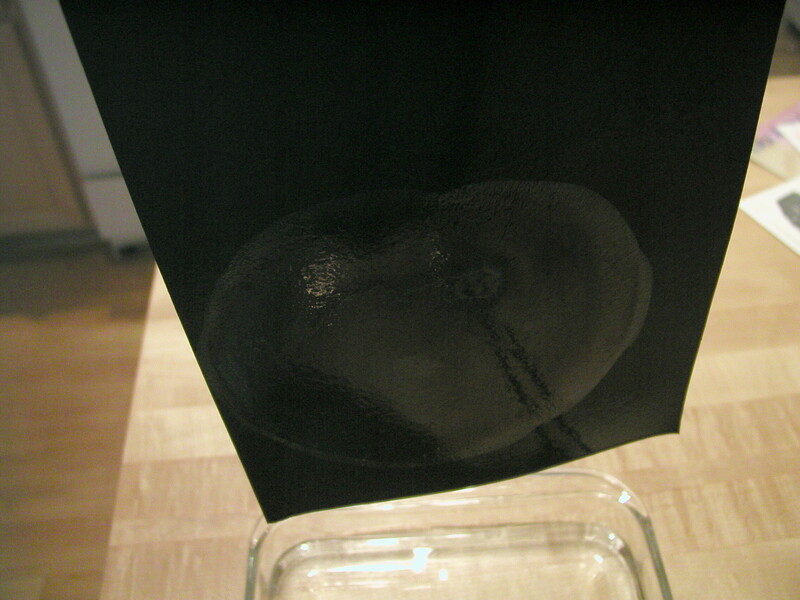 Black construction paper works well, but so does the slick coated glossy photographic paper used in ink jet printers. 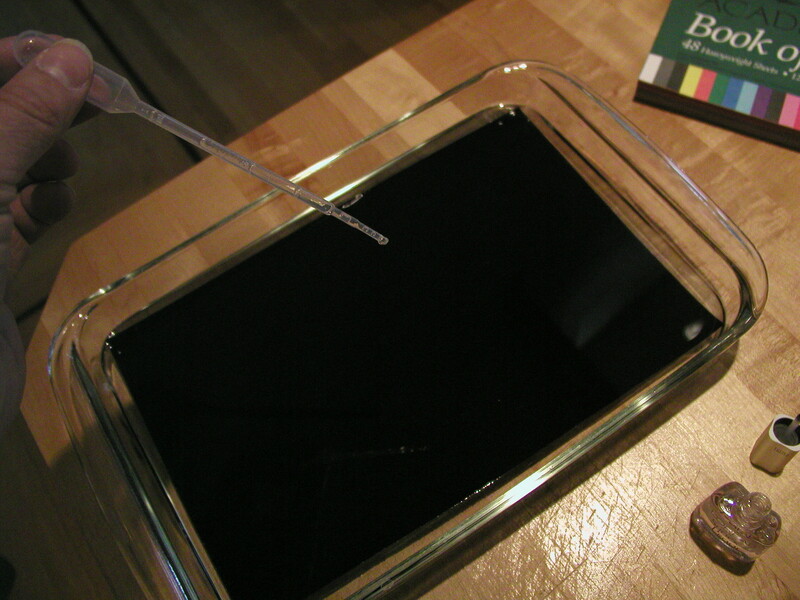 A cake pan or similar container that can hold water, and that is big enough to hold the piece of paper flat in the bottom. You can cut the paper to size if you don't have a pan big enough. An eye dropper that you can dedicate to this purpose, since it will not be good for much else when we are done. 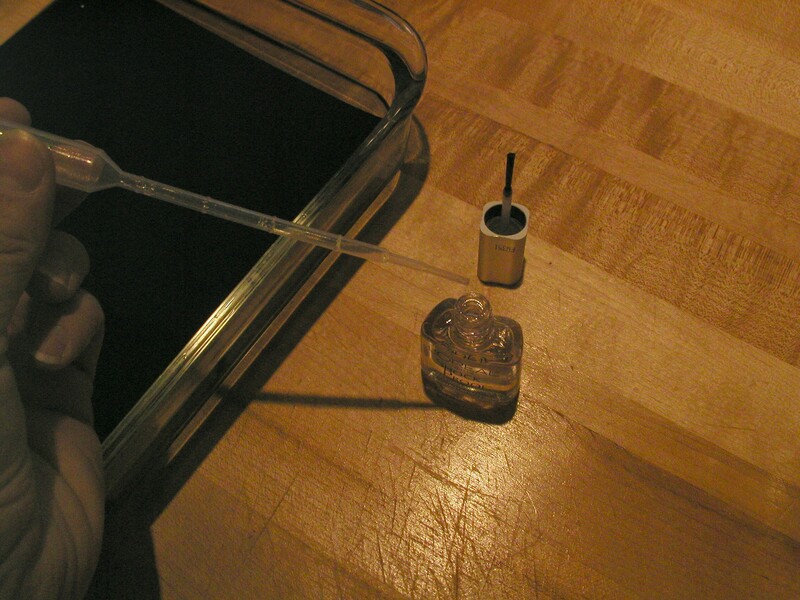 A disposable plastic pipette is ideal. Place the paper in the bottom of the pan. 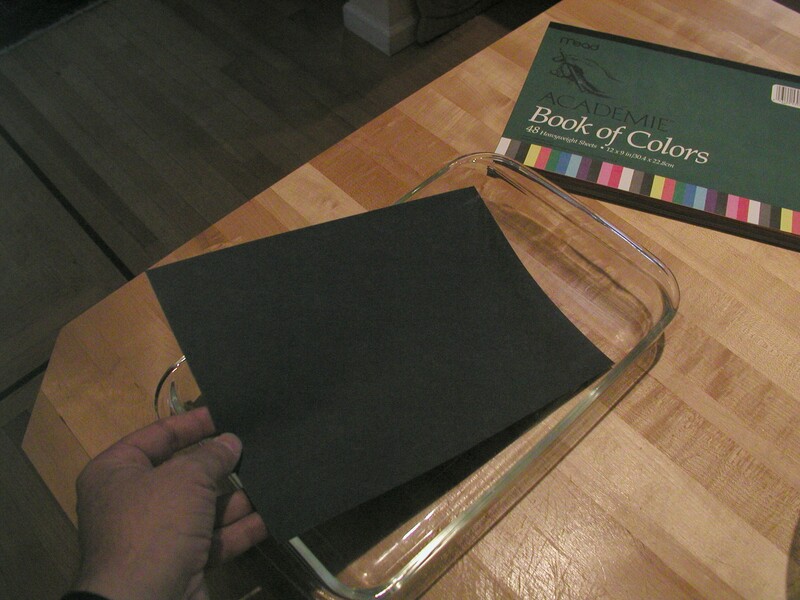 Fill the pan with water to cover the paper with at least a half of an inch of water. 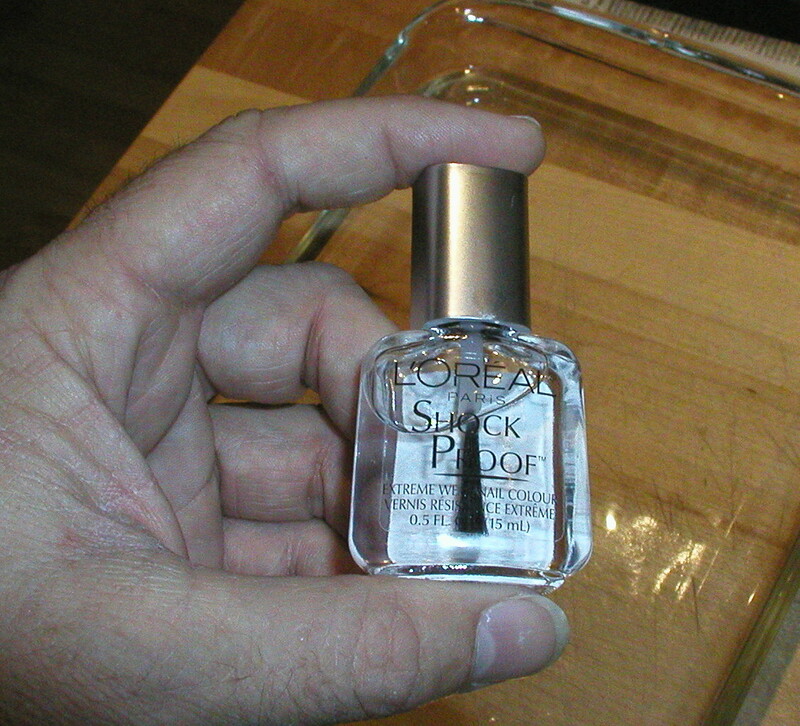 Put the eyedropper into the nail polish bottle, and squeeze just a little air out of it, to get just a half of an inch or so of nail polish into the eyedropper. We only need a single drop. Drop a single drop of nail polish onto the surface of the water. The nail polish drop will quickly expand to make a circle of film on the water. This film will be so thin, that it will only be as thick as one wavelength of light. Let the circle of nail polish film dry for a few minutes. The edges will generally wrinkle a bit, and the center will take longer to dry than the edges. Gently lift one end of the paper out of the water, making sure you catch the edge of the thin circle onto the paper. 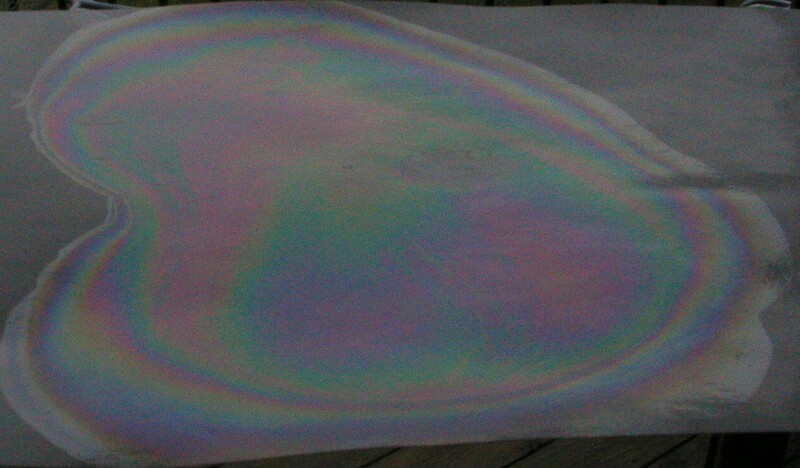 Let the water drip off the paper into the pan for a little while, and then set the paper (with the circle of film clinging to the middle of it) onto some newspaper to dry. To view the colors, hold the paper flat towards the light, and view it at a low angle. If you use more than one drop, you might get double patterns. The glossy photo paper leaves a nice smooth surface with many rings of color. The colors are caused by the interactions of several interesting qualities of light. Light travels at different speeds in different materials. In air, or the vacuum of space, it travels very fast (about 299,792,458 meters per second). In water, light travels one third slower than it does in air. We say water has arefractive index of 1.33. In the film we made from the drop of nail polish, the light is even slower, since the dried nail polish has a refractive index of 1.42. Light travels in waves. We can picture the waves of light as looking like waves of water in the ocean. The waves come by in parallel rows, one behind the other. The left edges of the waves encounter the material first, and slow down. The point just to the right travels a bit farther at the higher speed, but then it encounters the material also, and slows down. This happens all along the wave. Inside the material, the left part of the wave has been moving slower than the right side for a little longer as we look at each part of the wave. Imagine rows of people, all marching along holding hands. If the people on the left start marching slower, the columns will make a small turn to the left. The waves of light do the same thing. When light encounters a material with a higher refractive index, it bends into the material. But not all of the light bends in. 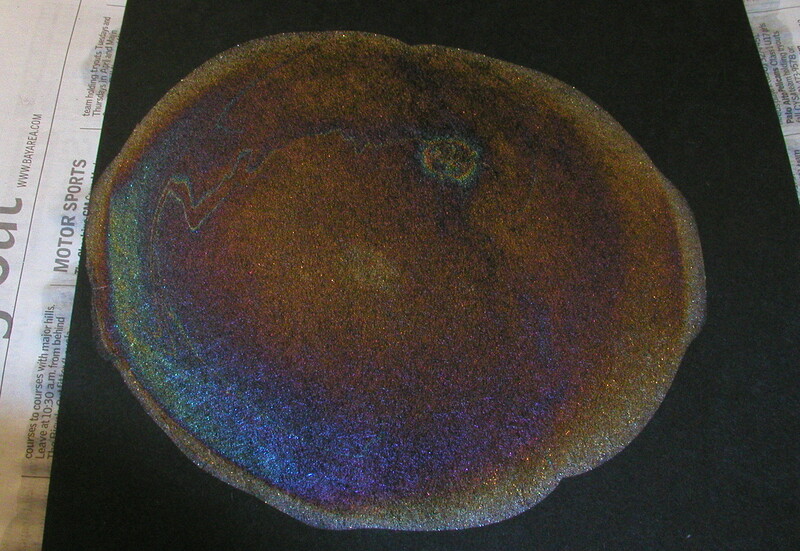 Some of the light is reflected off of the top surface. This is why you see sunlight reflecting off the top of the ocean. The light reflects off of the top because of the difference in refractive index. But there is another place where the refractive index changes suddenly. At the bottom of the film, the light leaves the film and goes back into the air. But not all of it goes back. Some of it is reflected back up, just like at the top surface. Light that reflects off of a top surface (from low index to high index) is completely out of phase with the light that reflects off of the bottom surface (high index to low index). The rows of waves don't match up -- it is like the rows of marchers missed a step. What we end up with is three rays of light. Two go up, and one goes through the film. The two top rays are probably not in phase. Their rows of marchers don't line up in matching rows. 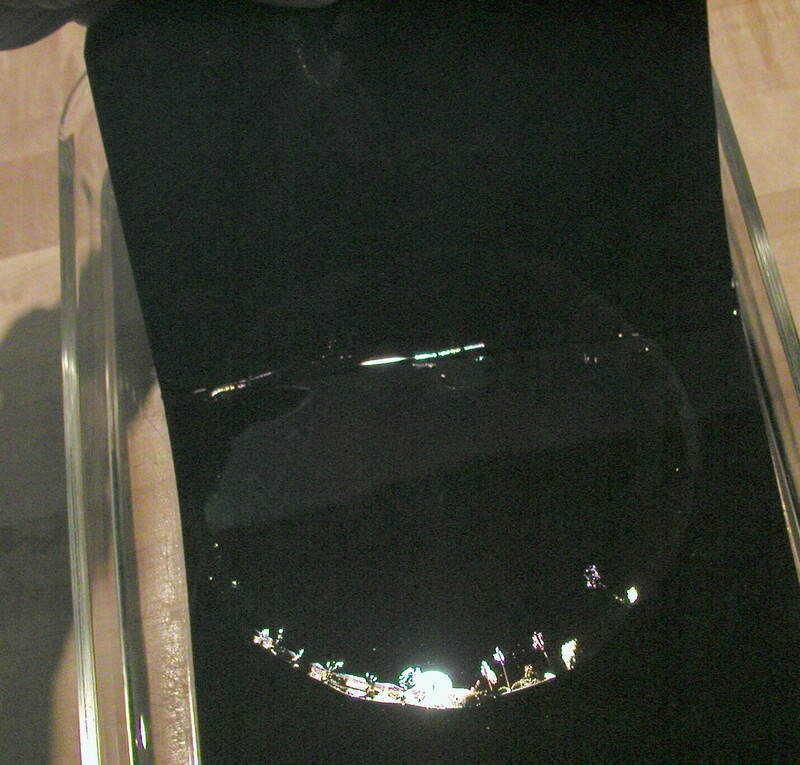 This is partly because the ray to the right has been shifted by the reflection at the bottom of the film. But it has also travelled farther than the other ray. If the rows happen to be in phase, the marchers will all line up, and the light will constructively interfere. It will appear twice as bright as a single ray, since both rays are combined. If the rows are completely out of phase, the light will destructively interfere. The tops of the waves of one ray will fill in the troughs of the second ray, and all we have is flat, with no waves. No waves means no light, and the rays disappear. Somewhere in between those two extremes, we will get some light, but not as much as two ray's worth. What is important to notice at this time is that there are two things we can do to adjust the phase of the rays, to make them either constructively or destructively interfere at our command. The first thing we can do is to change the angle at which the light hits the film. If the light comes in at a shallower angle, then the ray that enters the film will travel in a longer path in the film, and therefore be slowed down more than before, and comes out the top a little later. The other thing we can do is to change the thickness of the film. If the film is thicker, then the ray that travels inside the film has farther to go, and again comes out of the top a little later. White light is composed of waves that have many different wavelengths. Different wavelengths are seen as different colors by our eyes. Different wavelengths also travel at different speeds in a refractive material like our film. This means that the ray on the right will be delayed more in some colors than in others. So while one color may experience constructive interference and be bright, other colors will be dimmer or completely gone. Now we have all the pieces we need to understand the color patterns in the film. At the outside edges, the film is thinnest. The film gets thicker towards the middle. Since thicker film delays the light more than thinner film, and some colors are delayed more than others, some colors will be bright, and all the others not so bright, for a particular thickness of film. One thing to notice in the photos above is that the rainbow colors appear in rings. The outermost edge of the film is usually colorless. This is because the film there is often a single molecule thick, and is thinner than a wavelength of visible light. Inside of that edge, the first ring of colors shows where the thickness of the film is first in the range for making colors. 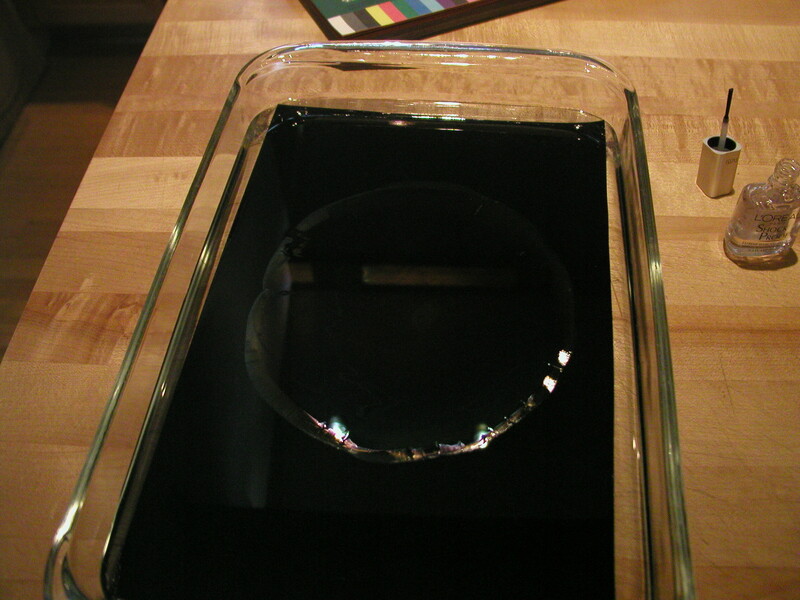 The other, inner rings are seen because the film is now two times as thick as necessary to show colors. The waves of light are now lining up where one ray has fallen more than a full wavelength behind the other. This can continue for several rings. As the rings become more numerous, the ones caused by very thick layers overlap one another, and eventually they all combine into white light, and no rings are seen. This is why we only see the rings in thin films. Below is a simple little calculator that will tell you the thickness of the film for each color of light you see when the light strikes the film at an angle you choose. Click in the spectrum to select a color. click on a button to calculate the third.